Travis Mitchell was fishing on the Hilo Breakwall on the Big Island with his 9-foot Ugly Stik using bread for bait when he hooked his 3-lb 4-oz bluestriped chub. He battled the fish using a BG 60 reel and 15-lb test before landing it and laying claim to a new state record. 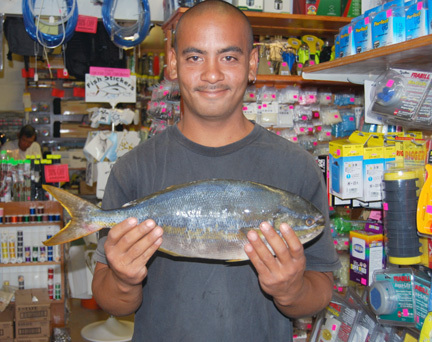 Noted ichthyologist Dr. Jack Randall does not believe that there is a resident population of these fish in Hawaii and that the bluestriped chubs found here and in Guam and Japan are from a breeding population in the Eastern Pacific (near Mexico).